According to OpenPrimaries.org, 43 percent of Americans identify as politically independent. In New York state, voters who haven’t chosen a party affiliation total more than 2 million – more than 20 percent of all registered voters in New York. 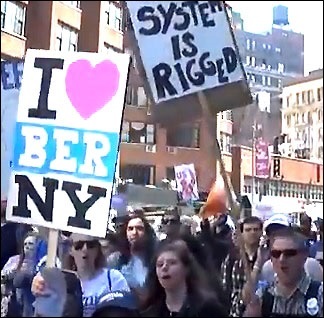 Unfortunately for them, they will be shut out of tomorrow’s New York primary where the stakes for the country’s future have never been greater. New York state is one of only 11 U.S. states that hold a “closed primary,” meaning that unless you are registered as either a Republican or a Democrat, you are precluded from voting in that party’s primary on April 19 in New York. Not only will Independents be barred from voting but those registered as Greens (about 26,000) or part of the Working Families Party (about 48,000) will also be locked out. This hits the Bernie Sanders campaign hard because he has won by large margins in states with open primaries where independents were allowed to vote. According to a national NBC News/Wall Street Journal poll conducted March 3-6, Sanders led Hillary Clinton 59 percent to 35 percent among independents. Sanders has also been endorsed by the Working Families Party which is actively engaged in his New York campaign. What is particularly outrageous to the millions of Independents that have been barred from participating in closed state primaries this year is that all taxpayers pay for these primaries – and yet, only registered Republicans and Democrats get to cast a vote. That hits people as decidedly un-American and fuels growing anger at a system perceived as rigged for the benefit of the one percent. But New York state has one other unique trick that is increasingly being viewed as a stealth form of voter suppression. In New York state, if you wanted to change your voter registration affiliation to Democrat in order to vote for Bernie Sanders, the cutoff was October 9 – a stunning six months before the actual primary. That’s the longest cutoff period of any of the 11 states with closed primaries. Most people are not even thinking about a primary election six months ahead of the actual date. 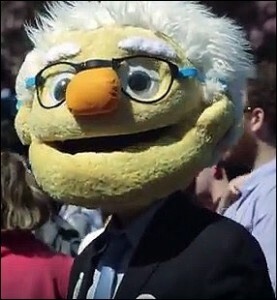 The first Democratic debate which would allow people to become inspired about a candidate did not occur until after the cutoff for changing party affiliation in New York state. The six-month cutoff in New York looks even more bizarre when contrasted against other closed primary states. In Florida, the cutoff to change your party affiliation is just 29 days before the primary. In New Jersey, it’s 55 days before the primary. It’s just a few weeks in other states. In addition to having party affiliations incorrrectly changed for thousands of voters, nullifying their ability to vote, primary voters in one of Arizona’s largest counties, Maricopa County, had 70 percent fewer polling locations open to them than in prior elections. This forced voters to wait for hours in long lines in the hot sun or simply give up on voting. With millions of people locked out of voting in Arizona’s closed primary, Hillary Clinton beat Sanders 58 percent to 40 percent. According to the New York Daily News, a lawsuit will be filed by Election Justice USA today on behalf of “hundreds of New York state voters” who are alleging that their party affiliations have been fraudulently changed to “not affiliated” or “Independent” by an invisible hand, which will mean they will be barred from casting an immediately recorded vote in tomorrow’s primary. The disenfranchised voters learned of the switch when they checked the status of their registrations online. 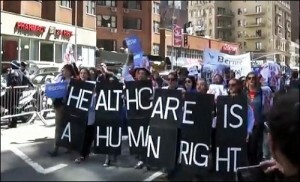 The lawsuit will be coming at a time when the popularity of Senator Bernie Sanders is surging in New York City and its boroughs. 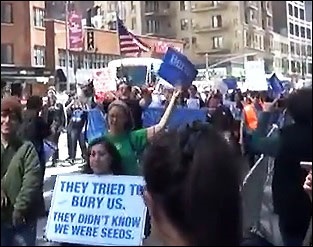 Beginning last Wednesday, when more than 27,000 supporters turned out for a Sanders rally at Washington Square Park in Greenwich Village, Sanders has seen a growing groundswell of support in New York. 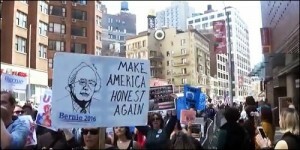 On Saturday afternoon, more than 4,000 Sanders supporters marched from Foley Square to Union Square, sporting handmade posters celebrating the slogans that Sanders has now made legendary. (See images of the April 16 march below.) On Sunday, April 17, the Sanders campaign reported that 28,365 people had turned out for his rally in Prospect Park, Brooklyn — the biggest Sanders event yet. The Clinton campaign, in contrast, is attracting hundreds of people, not thousands, to events held at much smaller venues. As millions of new voters become engaged in politics for the first time as a result of the Sanders revolution, many of the stealthy tricks of the entrenched two-party system are coming out of the shadows into the sunshine and failing to pass the smell test of a genuine democracy.